Cell Surface GRP78, a New Paradigm in Signal Transduction Biology presents a new paradigm that has emerged in the past decade with the discovery that various intracellular proteins may acquire new functions as cell surface receptors. Two very prominent examples are ATP synthase and GRP78. 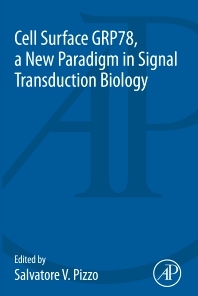 While the role of cell surface ATP synthase has been reviewed in various books, this book directs its attention to the story of cell surface GRP78. Studies from Pizzo’s laboratory identified cell surface expression of the molecular chaperone GRP78 as a major factor in prostate cancer and other malignancies. Cell surface GRP78 functions as a signaling receptor promoting tumor proliferation and suppressing apoptosis. Patients with a number of malignancies mount an autoimmune response to GRP78 and these antibodies, which bind to the NH2 terminal domains of GRP78, are receptor agonists whose appearance is a marker of poor prognosis. More recently, his lab has shown that antibodies directed against the COOH-terminal domain of GRP78 are receptor antagonists which may have therapeutic potential for treating patients whose tumors express GRP78 on the cell surface.